Handmade in Egypt with a traditional smoke experience in mind, the Khalil Mamoon Ashraf Star Ice Chamber is a work of art. The stem is a heavy metal model with an ice chamber attached to cool the smoke. 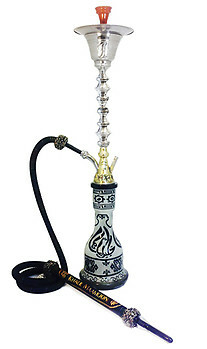 The durable design of this KM Hookah is perfect for easy setup and maintenance with a single hose setup and glass vase.